With average apartment rent in the Twin Cities at a record-breaking $1018 a month, Minneapolis Public Housing plans to send 184 families out looking for new places to live. That’s just one of the problems with the Minneapolis plan to knock down Glendale public housing and replace it with 550 new units that will mostly rent for market rates. 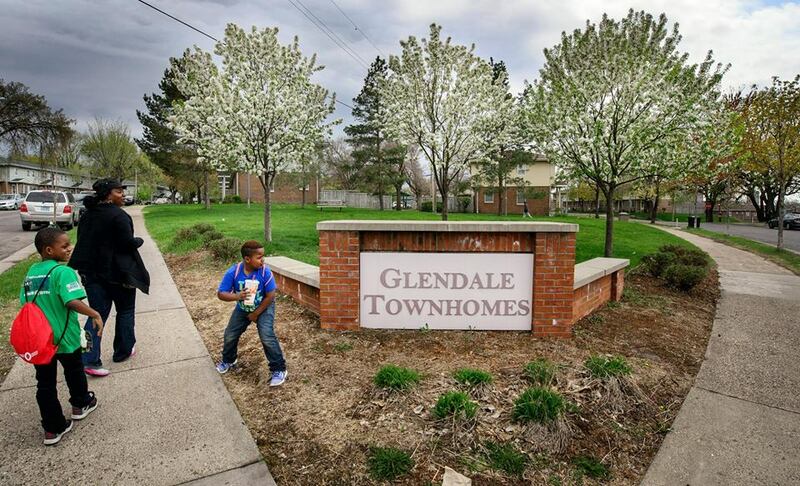 Glendale is a public housing project, Minnesota-style: 28 buildings with 184 town home-style units, going strong since 1952. The Minneapolis Public Housing site calls Glendale ” a welcoming community to thousands of low-income families and, in recent history, as a cultural corridor for Southeast Asian and East African refugee families who have immigrated to the United States and Minnesota.” Nonetheless, the city plans to tear down Glendale and replace it with 550 units of higher-density housing on the 13-acre site. Most of the new housing units will be market rate, but the city promises to preserve 184 units for current low-income tenants, using Section 8 federal housing subsidies. Right now, Glendale town homes and Pratt School provide community and stability for Glendale residents within the larger, economically and racially diverse Prospect Park neighborhood. If Glendale’s families are dispersed throughout the metro area, they lose that community and stability. They lose touch with the community school they know, and their children are dispersed throughout the metro area, losing connections with teachers and with friends. After bouncing around the Twin Cities during the years of construction, it’s unlikely that the families will reunited at the new Glendale. Even if they do, they’ll find a different community — one with more families in higher-rise buildings, with a majority of higher-income residents, where they will have only a minority voice in any Glendale resident organization. According to the Prospect Park East River Road neighborhood association, most of the communication about the project has happened online. That’s a handicap for parents who may not have internet access at home, and who may not speak or read English. About 60 percent of the families are from Somalia, Ethiopia or Southeast Asia. Many of the families in Glendale are Somali immigrants and Muslims. This year, Ramadan began on June 18 and ends on July 17. The comment period for the proposal ends July 13, with the public hearing on July 14. That’s an obstacle to full participation for Muslim families living in Glendale. Privatization means that this neighborhood will become a profit center, not a service center. Instead of focusing on housing and serving low-income families, the developer will focus on maximizing the rate of return on dollars invested. While the city plans to extract a promise to keep 184 units as Section 8 rentals, the rental process will be handled by the developer, who can pick and choose among the many Section 8-eligible tenants. Moreover, any agreement with the landlord is for a limited time — maybe 20 years. Just this May, St. Paul saw Como by the Lake end its 30-year Section 8 participation. Now 57 elderly and disabled tenants are left to shift for themselves. Glendale has been public housing since 1952. Privatization will end its public ownership and public housing status, and sooner or later, the new owners will be free to end Section 8 as well. Glendale residents are asking for more discussion and for consideration of more than one alternative for their future. The Glendale Housing Development Project Plan is being voted on by the City Council in July 2015. MONDAY, JULY 13 – Deadline to submit community and public comments to Carrie Flack Senior Project Coordinator, Department of Community Planning & Economic Development. Carrie.Flack@minneapolismn.gov, 612-673-5240. TUESDAY, JULY 14 — Public hearing on the plan at the Community Development & Regulatory Services Committee, 1:30 p.m.; Minneapolis City Hall, 350 S. Fifth Street, Room 317. MONDAY, JULY 20 — Ways and Means Committee on Monday at 1:30 p.m.; Minneapolis City Hall, 350 S. Fifth Street, Room 317.